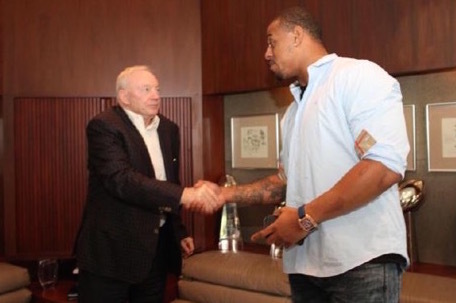 The Dallas Cowboys decided to sign former Carolina Panthers defensive end Greg Hardy to a one-year, $11.3 million contract on Wednesday, which raised more than a few eyebrows. Based off the look provided by Cowboys owner Jerry Jones in the photo above, he appears to be as skittish on the signing as folks on Twitter. Hardy, who could still face a suspension from the NFL for violating the league’s domestic violence policy after being arrested and charged with assault and threatening to kill ex-girlfriend Nicole Holder last May, is quite the gamble for the Cowboys under the circumstances. Over the past month, reports spread that Cowboys receiver Dez Bryant is featured in a video that was deemed to be “worse than the Ray Rice video” floating around. Now, if that’s true, Jones is taking the gamble of a lifetime housing Hardy and Bryant. Perhaps it was Hardy’s background that gave Tampa Bay some pause on Wednesday from making a commitment. Enter Jones and the Cowboys. Twitter’s reaction to the Hardy signing was mixed to say the least. Read up on Greg Hardy accusations & listened to 911 calls. It's a lot of "He said, she said." The woman comes of as a gold-digger. Overall, the Cowboys opted to worry more about obtaining a premium pass rusher than character but this isn’t the first rodeo for Jerry Jones with troubled players.